The CF800 Coefficient of Friction Tester is designed to determine the coefficient of friction properties of plastic films, laminates, foils and papers. The apparatus conforms primarily to the BS2782 method 824A and ASTM D 1894-78 but it can be supplied to suit other international test methods. The equipment is essential for measuring the slip properties of packaging materials to ensure smooth running on production packaging machines or to measure the effect that a coating or print has on base material. The new CF800XS features the latest in design and technology for machine set up, testing, measurement and recording using touch panel screen display units. The constant, smooth lead screw driven cross arm ensures reliable and repeatable measurement. 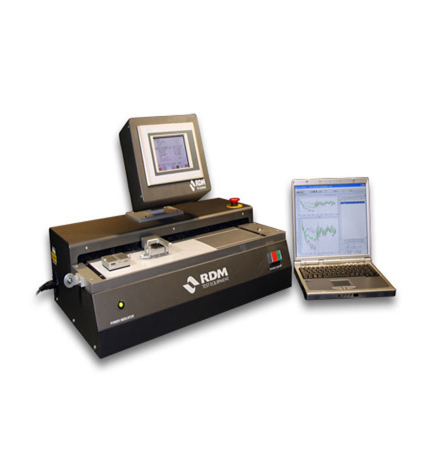 Other benefits include: Vacuum suction on the bed to clamp the material,optional temperature control circuit to heat the bed for ‘hot slip’ values, together with analogue recorder output and RS232 output for either chart recorder logging or computer data logging of results. Air pressure of 80-100 PSI supply with venture generated vacuum pulling +90% vacuum. Software package for data logging via RS232 link. Bed inserts to give test comparison with different metals.